Needlestick injuries can transfer serious infections including hepatitis B, hepatitis C and HIV. Keep safe and get smart about sharps by using the InSafe Sharps Safety System by Initial Medical. 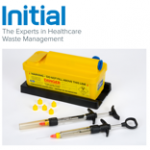 Completely compliant with government legislation, this unique sharps and syringes disposal box has been designed so that the needles are never exposed apart from when administering the injection. This prevents needles from causing accidents both before and after injections, heavily reducing the chances of needlestick injuries and the spread of infections. The syringe also aspirates and behaves exactly like a normal syringe, meaning that there will be no interruptions to your service. Find out more by contacting Initial Medical today.